Jono Winnel really knows how to capture this beauty, the one with ebony black hair and painted red lips. what a stunner. 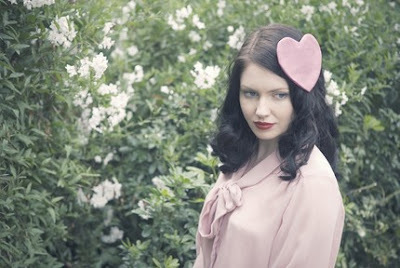 I love love love the new range of hair accessories entitled Hopelessly Devoted dreamed up and made by Gaby Adamidis-(check out her store on etsy) Each piece is just remarkable and so sweet. My advice treat yourself to some lovely hair accessories or even a sleeping mask. what more could a girl want?